Armand “Blackbird” Degas (Mickey Rourke) is a mafia hitman who shoots to kill and never leaves witnesses…until now. Faced with identification from Carmen and Wayne Coulsen after a botched extortion attempt he teams up with a young sociopath Ritchie Nix to tie up loose ends. Unfortunately his next targets are put into witness protection and used as bait by the police to lure Blackbird out. Based on the novel Killshot by Elmore Leonard (who brought us the source of films such as Jackie Brown and Mr. Majestyk) this is a taut thriller which focuses on Armand Degas and his ultimate downfall. Mickey Rourke is a very subdued half breed Indian who has made a living as a professional assassin for the mob. We meet him as he kills a mafia boss to allow the victim’s stepson to usurp the family business; however a girlfriend of the new boss is also murdered due to Armand’s paranoia to leave no one alive who sees his face. He must now stay on the run from the vengeful new mob boss. We have a flashback sequence that explains Armand’s compulsion to leave nobody alive where he accidently kills his younger brother even when it seems much wiser to just flee the scene. He is carjacked by a young criminal Ritchie Nix but the two quickly become partners in crime as Armand is reminded of his dead brother by Nix, who likewise is in awe of Blackbird’s past. They try to extort a real estate business which fails largely due to Ritchie’s incompetence, employees Carmen and Wayne Coulsen see Armand’s face which becomes the main plot of the movie. Armand must follow his compulsion to kill all witnesses. The police soon identify the danger Carmen and Wayne are in and place them in witness protection. Armand tracks them down to gun them in cold blood, first he shoots his partner Ritchie who disappoints him in not being the person he thought he was, but is shot dead by Carmen moments before he was to finish off Wayne. Mickey Rourke is very good as an emotionally stunted, damaged individual who kills with no feeling, his cold murder of an Indian friend is truly unsettling. He shows some warmth to a brief Rosario Dawson role who plays an Elvis obsessed girlfriend of Ritchie. She is later killed by Ritchie who seems to be following Armand’s motto. Ritchie Nix is an interesting character played by Joseph Gordon-Levitt, a manic psychopathic loser who seems to become even sicker and more twisted under Armand’s influence. The witnesses are less interesting, Diane Lane as Carmen brings little sympathy to her character while Thomas Jane’s Wayne would be better off to take up an offer by a hot waitress then waste any more energy trying to salvage his failing marriage. The mafia and cops seem underdeveloped caricatures and add little to the story. Picture quality is ok shot in 2:35:1 with a running time of 91 minutes. Dolby Digital 5.1 is reasonable with the typical gunshots and clear dialogue. Extras are non existent on this review disc. 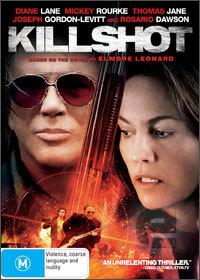 A thriller with a good performance by Mickey Rourke, some cold blooded scenes and a reasonable story. There is something lacking though and it never reaches any great heights. There are no characters that evoked any real sympathy which hampers any emotional attachment to the film. I enjoy Mickey (Angel Heart is one of my favorite movies) and I would recommend this to his fans and those who enjoy Elmore Leonard’s novels, who might find something to like as well.